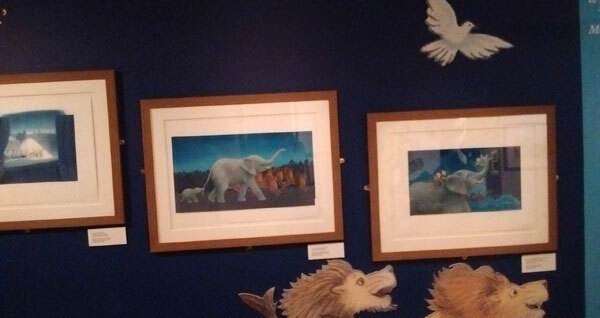 On Friday I finally made it up to Newcastle to catch the National Centre for Children’s Books, Seven Stories’ exhibition Painting with Rainbows – A Michael Foreman Exhibition, which closes today (sorry!). 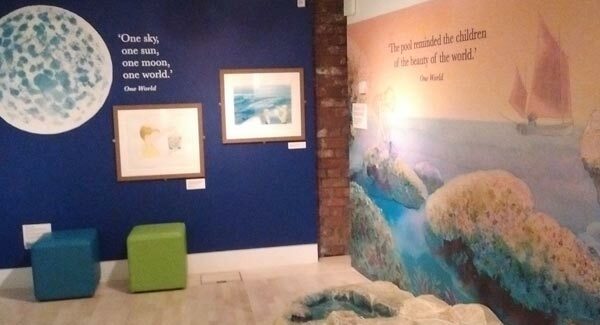 The good news is that it will be heading out on tour: so far, it’s lined up to be at the Harris Museum and Art Gallery, Preston, from 4th July – 6th November 2016. 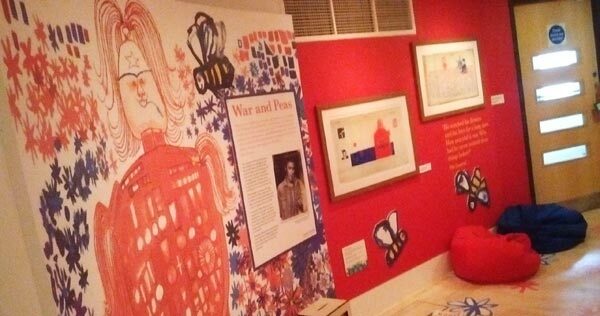 The exhibition takes visitors on a journey through Michael’s long career as an illustrator, beginning with the series of books inspired by his early childhood growing up on the Suffolk coast during the Second World War, and indeed by the effects on his childhood of the First World War, which deprived him of ever knowing all four of his uncles. 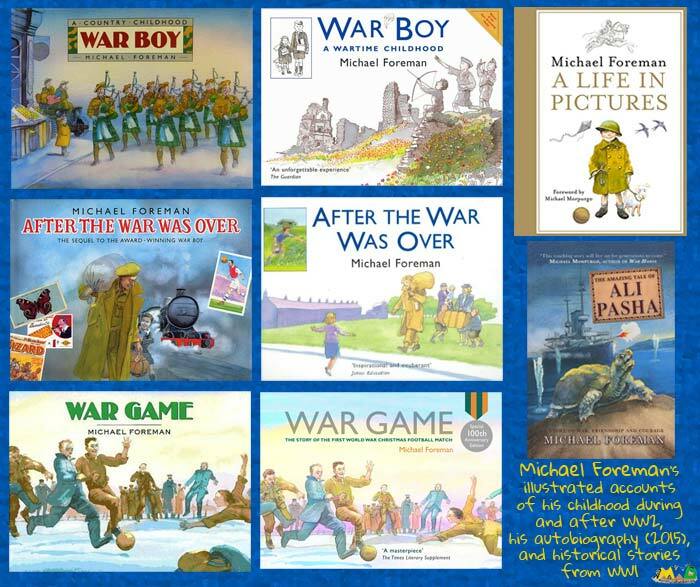 I already knew his autobiographical books War Boy: A Wartime Childhood and After the War was Over and I was glad to discover the latest edition of War Game, a fictional account of the famous Christmas Day truce and football game in 1914 – Michael paid tribute to his uncles by naming his characters after them and it’s definitely worth pointing out that this ‘Special 100th Anniversary of WW1 Edition’ published in 2014 (Pavilion Books) has been enhanced with factoids and photographs of artefacts in the margins as well as endnotes profiling football in the First World War and famous footballers, including Walter Tull. 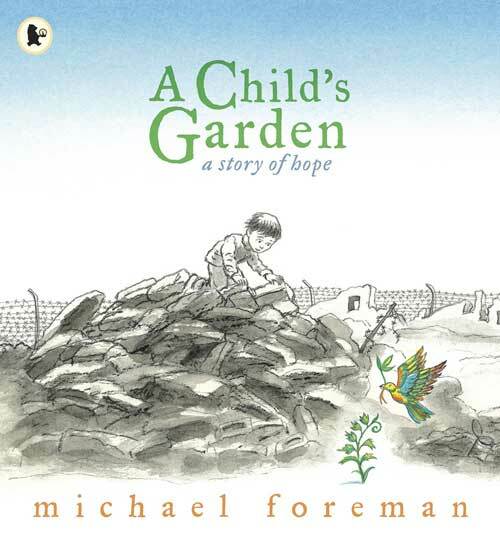 I had the great pleasure of interviewing Michael in 2011, following the selection of his wonderful book A Child’s Garden: A Story of Hope (Walker Books / Candlewick Press, 2009) for the Spirit of PaperTigers Book Set (now WaterBridge Outreach). So I was really hoping to see original watercolours for the book – and I was not disappointed. They are just so beautiful – and the colours of the plants and the birds burst from the paper,away from the greys that are themselves so well defined against the white background. Just like the book, but more so because of the texture and the definition of the originals. 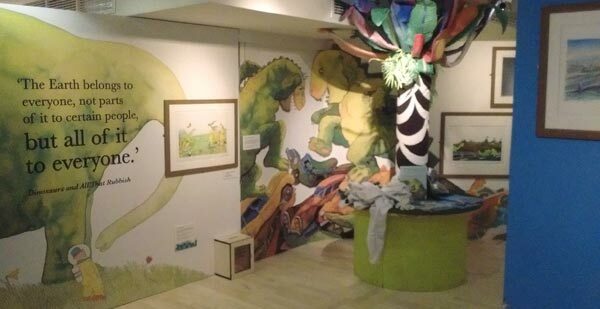 And I loved their display area, with a huge wooden green plant like the one in the book. I tied my ribbon to it with a wish for peace. And the other thing I was looking forward to was coming face to face with Michael’s signature blue. I found it, of course: especially in illustrations from Why the Animals Came to Town and The Mozart Question (written by Michael Morpurgo), which, set as it is in the holocaust, Michael described as the most harrowing work he’s ever done. That blue is the blue of shallow seas over white sand – the blue that lifts your heart. The blue of our family’s happiest times. 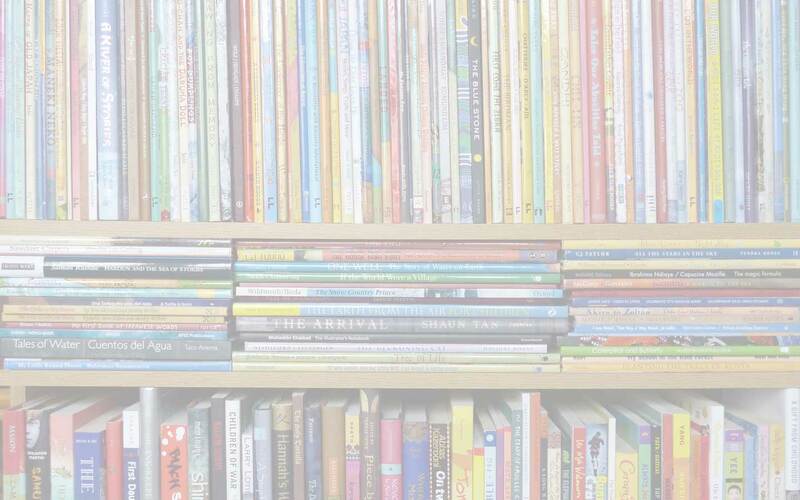 It can’t have been easy deciding which of Michael’s 250+ books to focus on for the exhibition but Seven Stories have risen to the task with their usual aplomb and imagination. The journey through his long career offered insight into the constant strands running through his work: a striving for peace and friendship and looking after each other and our planet – and football/soccer, which before the exhibition I hadn’t realised was such a constant. So what were other highlights for me? Finding out about Ali Pasha the well-travelled tortoise in The Amazing Tale of Ali Pasha (Templar Publishing, 2013), which will be reissued by Square Fish later this year as The Tortoise and the Soldier: A Story of Courage and Friendship in World War I. The vibrant display around The General and War and Peas. Seeing originals for Mia’s Story: A Sketchbook of Hopes and Dreams, Michael’s very special book set in Chile about a little girl who, aided by her faithful animals, becomes a symbol of hope in her journey out of poverty. Finding out more about Michael’s friendship and incredibly fruitful collaboration with Michael Morpurgo. 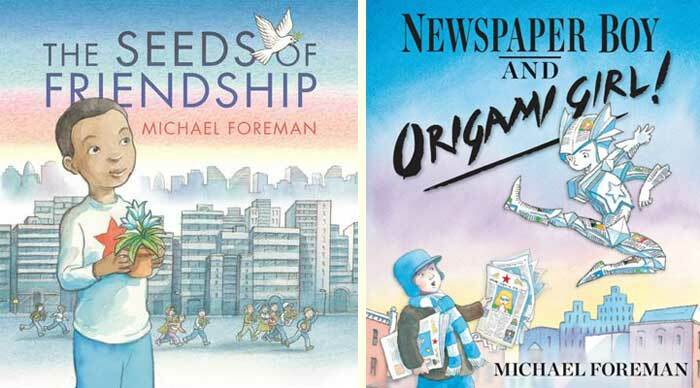 Being reminded that I really need to seek out Michael’s recent book, the anti-bullying Newspaper Boy and Origami Girl (Andersen Press, 2012). A Child's Garden, A Life in Pictures, After the War Was Over, Andersen Press, Mia's Story, Michael Foreman, Michael Morpurgo, Newspaper Boy and Origami Girl, One World, Painting with Rainbows - A Michael Foreman Exhibition, Pavilion Books, Seven Stories, Templar Publishing, The Amazing Tale of Ali Pasha, The General, The Mozart Question, The Seeds of Friendship, The Tortoise and the Soldier: A Story of Courage and Friendship in World War I, Walker Books, War and Peas, War Boy, War Game, Why the Animals Came to Town. Bookmark. Thank you, Patrick – I so enjoyed meeting you too – especially talking about The Sea-Thing Child. And I hope we will meet again.